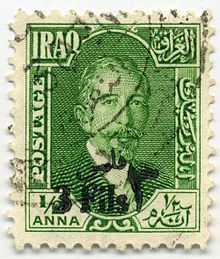 The first indigenous stamp of Iraq was published in 1923. Interestingly, these stamps were of denomination of Anas and Rupees, the currency of India at that time. Image of King Faisal I of Iraq appeared in 1927 on stamp valued at Rupee 1. Later he appeared on many stamps. 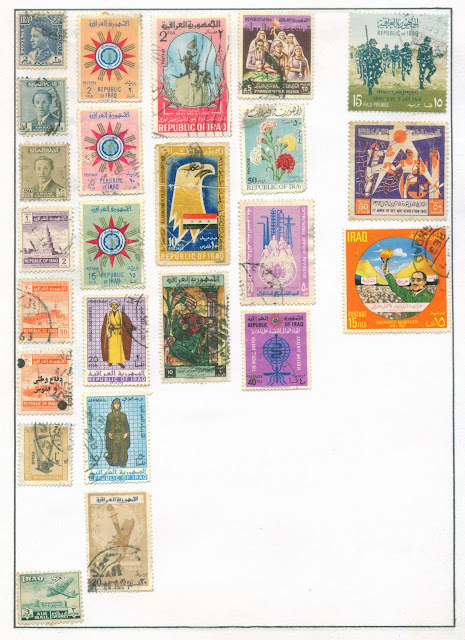 With the independence of Iraq in 1932, the denomination of stamps from Anas and Rupees was changed to Fils and Dinars, the traditional Arab currency of neigbouring Arab states. The first commemorative stamp of Iraq was issued in 1949 on the 75th anniversary of the UPU. This was followed by coronation of King Faisal II, when a set of three stamps was issued in 1953. My collection of stamps of Iraq is of the period prior to that of Saddam Hussain as shown above. 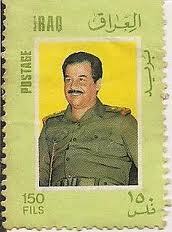 The slain president Saddam Hussain first appeared on Iraqi stamps in 1976 when he was the vice president of Iraq. He continued to appear on Iraqi stamps till 5th February 2003, when his era came to an end with the NATO invasion of Iraq. The Coalition Provisional Authority administering the affairs of Iraq issued the first stamp after Saddam Hussain on 29th January 2004. And since then new stamps of Iraq have been in use.